Melk has been a spiritual and cultural center of the region for more than 900 years. Visitors to the abbey can look forward to a fascinating museum covering the history and present-day life of the monastery, the staterooms and much more. 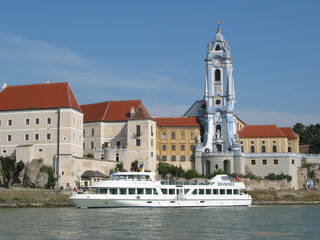 Birgit and Barbara Brandner, two sisters from a venerable old family of mariners, set out in 1995 to establish a new caliber of passenger ship service and cruises on the Danube. You can look forward to a wine experience for all the senses at Winzer Krems. We invite you on a scintillating exploration of the fascinating subject of wine. SANDGRUBE 13 wein.sinn lets you delve into this subject and gives you glimpses behind the scenes. This, the loveliest Renaissance castle north of the Alps is known for its excellent annual exhibitions that explore topics of cultural and contemporary history and archeology. Situated between the historical centers of Krems and Stein, the caricature museum in Krems and Kunsthalle Krems are both imbedded in the Wachau, a lovely landscape shaped by human hands. You can be sure of an engaging and humorous art experience. The ruins of the Aggstein fortress are perched 300 meters above the Danube on a narrow rock ridge. Legend has it that robber baron Jörg Scheck vom Wald held prisoners captive in the little rose garden here. 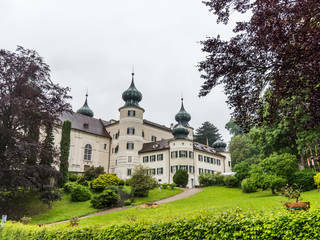 Artstetten is a fairy-tale castle with seven characteristic onion towers and formerly served as a summer residence for the Austrian imperial family.